Mission style furniture offers a warm welcome with the Amish Williamsburg Mission Dining Chairs. This stately design adds a timeless appeal to any dining table. Solid wood furniture offered in this simple mission style creates a versatility you'll love.The Williamsburg blends easily with a traditional or modern decor. 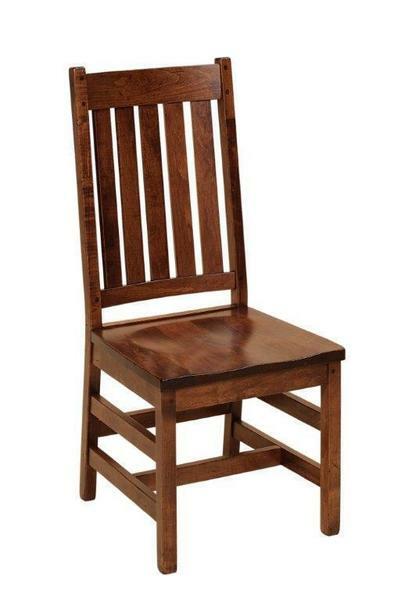 Rich wooden slats and a shapely seat contribute to the appeal of this mission dining chair. When it's simple elegance you're after, the Williamsburg delivers with the understated mission style. Superb craftsmanship supports every piece of mission furniture, providing full function within a lovely form. Shown in Brown Maple with CF 7992 Asbury Brown stain.